Light output. With a rated maximum light output of 1500 lumens, the HD8300 is a great projector for both large-screen home theater and more casual presentations in the living room. Its Cinema mode, which has the best color and contrast performance of all of the projector's preset modes, measures 832 lumens in standard lamp mode with the lens at its widest angle setting. Bright lamp mode increases lumen output by about 20%, bringing Cinema to 996 lumens. On a large screen of 150" diagonal or greater, in a room with good control over ambient light, the HD8300 looks superb. Smaller screens look bright and clear in rooms with some ambient lighting. The HD8300's image modes are all in the same ballpark when it comes to lumen output. In addition to Cinema, available modes include Reference (761 lumens), Photo (896 lumens), 3D (704 lumens), and Bright (872 lumens). All of these modes were measured using the lamp's Standard setting and the widest angle available on the projector's 1.5:1 zoom lens. What's missing from the HD8300 is a preset image mode that produces between 400 and 600 lumens, which would be useful for owners of small screens or folks with excellent ambient light control in their theaters. Note that the HD8300's zoom lens loses up to 32% of its light output at the telephoto end of its range, which brings Cinema mode to 573 lumens. However, not all users will be able to use the lens at max telephoto. With no manual iris, the only remaining option for lower lumen output besides the lens is a neutral density (ND) filter. If you need more brightness from the HD8300, say for a football game in the living room, you can use Bright mode with the Bright lamp setting (Dear Optoma, this is confusing) and the Lamp Native color temperature preset to push output up to around 1200 lumens. In exchange for the extra light, though, you lose most of the HD8300's black level, some dynamic range, and color accuracy goes to pot. Still, if you're in ambient light, you'll be losing contrast anyway. Color. Even at its factory defaults, the HD8300 has respectable color. As far as color temperature, the D65 preset measures around 6000K with no adjustments--a touch too warm, but certainly livable. Calibration of this projector was quick; the controls are responsive and the adjustments have enough granularity that it's easy to hit the exact value needed. After ten minutes with our CalMAN calibration system, the HD8300 was producing 6500K across the board. 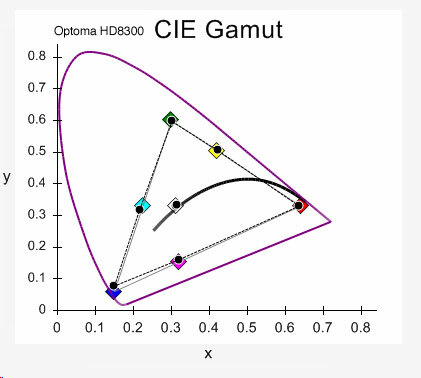 Color gamut on the Optoma HD8300. The color gamut is likewise in pretty good shape without any adjustments, and the HD8300's color management system is easy to use. Twenty minutes of fine-tuning produced a color gamut nearly identical to the Rec.709 standard used for HD. In English, this means that movies and video shown on the HD8300 will look exactly how the director wants them to look. 3D. The HD8300 is capable of full HD 3D from any HDMI 1.4 enabled 3D device. This means you can hook up your 3D Blu-ray player, satellite or cable set-top box, or other 3D device directly to the HD8300 and everything will work perfectly. Like the HD33, the HD8300 supports Optoma's radio frequency (RF) active shutter glasses. Unlike infrared systems, line-of-sight between the glasses and the emitter is not required when using RF. This simplifies emitter placement in a big way--as long as the emitter is within 15 meters of the audience, regardless of direction, the system will still work as advertised. Obstructions between the emitter and the glasses can reduce the range somewhat, so be sure to test your configuration before mounting anything permanently. In 3D, the projector takes certain options out of your hands, namely the auto iris, PureMotion (the control remains active but has no tangible effect), and image mode selection (you are limited to 3D and User). On the other hand, you retain control over lamp mode, while several competing projectors disable this option. Warranty. The HD8300 has a full three-year warranty complete with Optoma's Express Replacement service, as well as two years of coverage on the lamp. These days, it is increasingly rare to see a manufacturer stand behind their product the way that Optoma has with the HD8300. Color wheel. As the HD8300 has a native speed of 120Hz, color wheel numbers must be interpreted slightly differently. The projector has a six-segment color wheel (RGBRGB) that runs at 3x speed; that is, it refreshes each color three times per frame. However, since the projector runs at 120Hz, that means the equivalent of a 6x speed color wheel when viewing 60Hz content. Whichever way you slice it, the end result is a rainbow-free image. Connectivity. The HD8300 has the standard slew of connections, but the highlights are a pair of HDMI 1.4 ports, a set of YPbPr component inputs, and a pair of 12V triggers. The VESA port for the 3D emitter is also located here, and looks kind of like an s-video jack. It's even located next to the composite video port. It is not advised that you try to use it to display s-video, however--it won't work and you'll probably break something.